Last Spring we had a great adventure in Florida. We landed in Orlando and then drove to Gainesville. After a couple of days in Gainesville, we drove to Steinhatchee. I loved it there! There were river houses and everything seemed so relaxed. Oh, to have a summer vacation where you just relax, read, swim and enjoy the peaceful air around you. 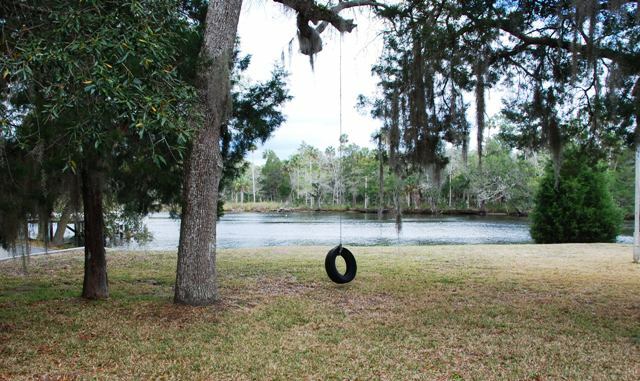 We took one of my favorite pictures in Steinhatchee, the tire swing with the river in the background. Whenever I look at this picture I am reminded of the simple things in life that make me happy: children, family, friends and the beautiful world around me. Remember to stop and look around. Remember if you love someone to tell them. Remember that you are important in this big world and no one can take your place.